Mayor Rahm Emanuel announced that 12 other cities have joined the City of Chicago in posting research from the U.S. Environmental Protection Agency’s (EPA) Climate Change Website after the Trump administration unceremoniously removed it from the federal government’s websites on April 29. 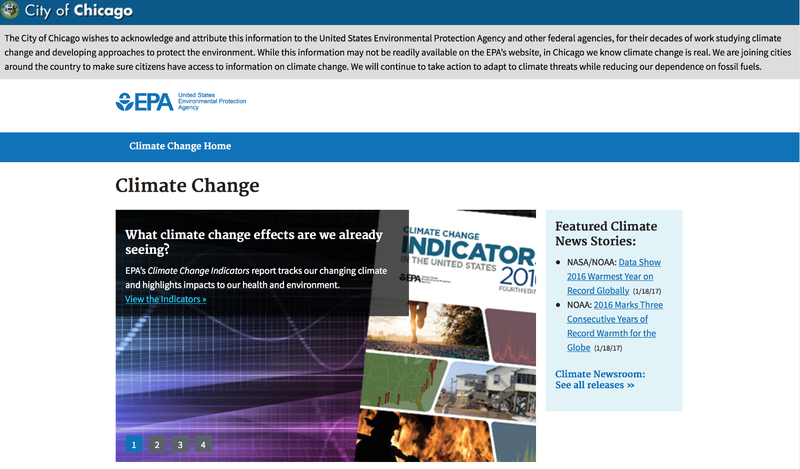 The Chicago Department of Innovation and Technology has uploaded this information to an open-sourced website so that other cities, academic institutions, and organizations can post it to their own websites at https://chicago.github.io/climatechangeisreal/. It includes information on the basic science behind climate change, the different ways in which weather is impacted from increased greenhouse gas emissions, and actions the federal government has taken to reduce the impact.